Discover frosty fun for the whole family at Disney’s Blizzard Beach Water Park, a one-time ski resort that has melted into a watery wonderland. Zip down the slushy slopes of Mount Gushmore on one of the world’s tallest and fastest waterslides. Float down the tranquil river and sunbathe on the white-sand beach. Children under 48 inches tall can even splash around in their own water play area with a snow-castle fountain and kid-sized waterslides. Disney legend has it that after a freak winter storm blanketed the area with snow, Florida’s first ski resort was born. When temperatures returned to normal, the powdery snow turned to slippery slush. Slalom courses, bobsled and toboggan runs became downhill waterslides. The chair lift carried swimmers instead of skiers. The ski jump became the tallest, fastest waterslide in the nation. Ski Patrol Training Camp: Make a real splash at this training camp play area, designed especially for pre-teens. Swoosh down inner-tube slides, slide hanging from a T-bar, whisk down curvy slides and take a challenging ice-flow walk across floating icebergs. Slush Gusher: Speed down the 90-foot tall Mount Gushmore in a slush-banked mountain gully. Two humps create brisk fun-filled ups and downs on your journey to the bottom of the mountain. Launch down the slopes in the shadow of Summit Plummet. Height Requirement: 48″ (122 cm) or taller. Downhill Double Dipper: Shoot the tube and blast down the slopes at 25 miles per hour in these side-by-side speed slides. Hop on your inner tube and disappear into a tunnel before remerging seconds before your splashdown. These two parallel 230-foot-long racing slides are a slippery good time. Height Requirement: 48″ (122 cm) or taller. Teamboat Springs: Bring the whole gang aboard one of the longest family raft rides in the country. Twelve hundred feet of white water and rushing waterfalls make the twisting, turning journey from the top of the mountain to the bottom a giggling, screaming adventure. Three- to six-passenger inner tubes ensure that the family that rafts together, laughs together! Toboggan Racers: Race in one of eight side-by-side lanes that toboggan down the mountain. Hang on to your mat and head down the slopes. Exhilarating dips make your charge to the finish line an avalanche of fun. Runoff Rapids: Take your choice of three incredible inner tube rides that careen down the hill into a refreshing plunge pool. Each flume is different, so try all three! One is completely enclosed, while the others are open. All three twist and turn on tantalizing water-logged journeys down the banks of Mount Gushmore! Snow Stormers: Speed down the slopes in switchback slalom-style racing slides. Bank through the curvy path marked by ski-type gates. Choose from one of three different downhill racing courses. Hop on your mat and compete with your friends. Meet in the plunge pool at the bottom of the course and hop out of the water to start all over again! Melt Away Bay: Take a dip in the gently bobbing waters of this bay that is fed by the melting snow run-off from Mount Gushmore. The expansive one-acre pool is great for those who want to wade in and just get their feet wet or take an invigorating swim. Pounding waterfalls make a great retreat when you really need a refreshing plunge. Summit Plummet: Look out below! Dare to take the vertical plunge from the top of one of the world’s tallest and fastest free-fall body slide. At an exhilarating height of 120 feet, this sky-scraping ski jump of a thrill ride drops you down the slopes at a speed-limit-breaking 55 miles per hour for a 360-foot long trip back to the lower atmosphere. Height Requirement: 48″ (122 cm) or taller. Cross Country Creek: Kick back and “chill” in an inner tube on this gently meandering river that flows around the entire Park. Bask in the warmth of the sun. Use the Creek as a transportation system to effortlessly get from one area of the Park to the next or just ride along and watch the world drift slowly by. Chairlift: Scale the slopes in a colorful, fanciful wooden chair lift with umbrellas and dangling skis. Hop aboard this one-way access to the top of Mount Gushmore for access to Summit Plummet, Slush Gusher, Teamboat Springs, Toboggan Racers and Snow Stormers. 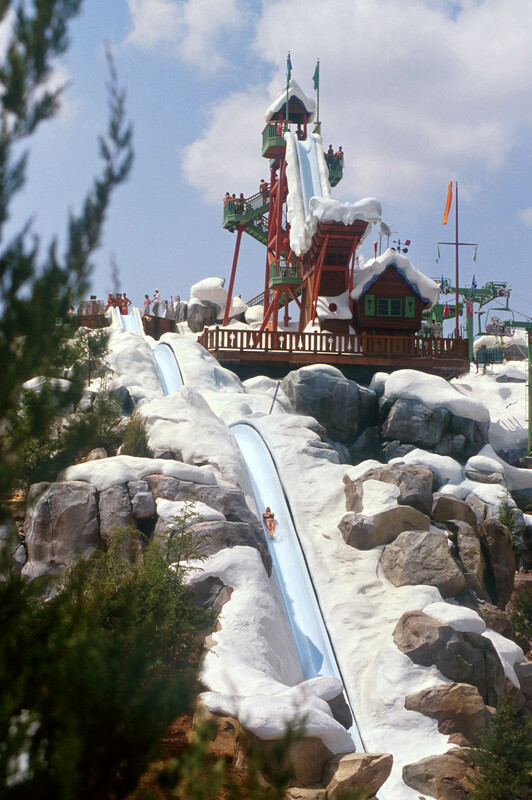 Disney’s Blizzard Beach-What a Brrrrrilliant Idea! was posted by Magical DIStractions creative team member, Lisa McBride, on January 11, 2015.